13. A kiss, a ring and now a Guinness World Record? All participants must pick up their race kits during the BERLIN VITAL sports and health expo in the hangars of the former Tempelhof Airport (U6, station "Platz der Luftbrücke"). Try to avoid picking up the kits on Saturday between 11am and 2pm, as there may be waiting times of up to an hour then. If possible, pick up your race kits on Thursday or Friday if you live in Berlin or are arriving early. + Race kits must be picked up by each participant personally—a pick-up for others or groups is not possible. + You must present your start pass and a photo ID (identity card, passport, driving license). + You will receive a bracelet when you pick up your race kit, which must be worn on your arm until you cross the finish line. 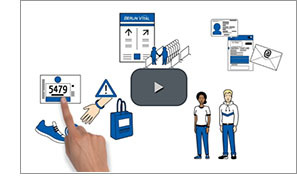 This helps ensure that the registered participant is also the person who runs. Transferring a race number will lead to disqualification. Additional information can be found on our website. + If you booked the option "clothing drop-off" you will receive a transparent bag with your race kit. Only this bag can be used to bring your clothes, etc. into the pre-start area (Reichstag meadow) on Sunday. Backpacks, travel bags, and suitcases may not be brought in this area. + Participants who have booked the “poncho” option will receive one after the finish. The start number will display a poncho symbol. Further information below. + NEW: On Sunday, your race number entitles you to use public transport between 5:30 am and 10:00 pm. If you booked the "poncho" option when registering for the race, you will receive one at the finish. Your race number includes a poncho symbol. You may not use the clothing drop-off option if you are getting a poncho! If you selected "clothing drop-off” when you registered, you will receive a transparent bag and a sticker with your race number to label the bag. Our simple interactive show explains this in minutes. 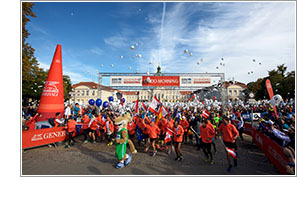 From Wednesday to Saturday, there will be an extensive supporting program for the 2018 BMW BERLIN MARATHON: Hall of Fame, BERLIN VITAL marathon expo, GENERALI BREAKFAST RUN, Bambini Run presented by berlinovo, mini-MARATHON for schools, BMW BERLIN MARATHON Inline Skating, and an ecumenical service on Saturday evening. 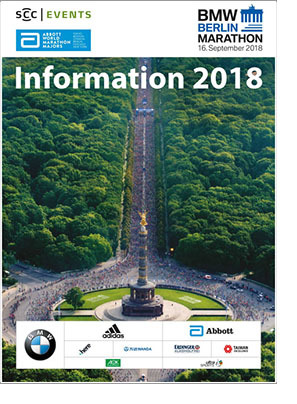 Further information about the supporting program for the BMW BERLIN MARATHON 2018 is available on the website. The interactive route map for the BMW BERLIN MARATHON makes it easy to see where the route is closed or free at a certain time. It is available in three variants: for spectators, participants and residents. Just in time for the BMW BERLIN-MARATHON we launch a special cup. The re-usable cup weighs only 10 grams, is practical, reusable and protects the environment. With this cup we can save in the future thousands of non-recyclable plastic cups. In order to take part at this pilot project which is limited to a certain number of runners just come by at our booth at BERLIN VITAL, get the cup and find out where the additional test water stations are located on the track. We are also looking forward to your opinion. A small step for a runner, but a great one for the environment. This year HERE Technologies is taking you beyond the course of the 45th BMW BERLIN-MARATHON. We want to encourage you to discover the unknown behind the streets and road signs of the 42-km track. 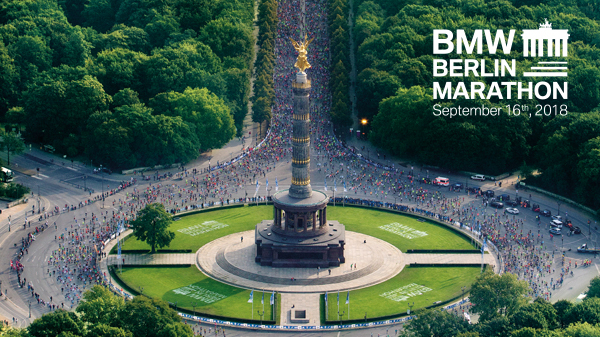 On our landing page, you can find out how we help cities to run more intelligently, while exploring the people, stories and history that shaped the streets the BMW BERLIN-MARATHON winds through. Get a real sense of what makes Berlin so wonderfully unique, whether you’re running it yourself or cheering for your friends and family. Take a look beyond the map here. Put on your red shirt at GENERALI FRÜHSTÜCKSLAUF 2018 and win your ticket for the GENERALI BERLINER HALMARATHON 2019. Follow Generali Deutschland AG on facebook and post your picture in a red shirt under the raffle. In the Olympic Stadium you will find the perfect photo opportunity at the finish. A kiss, a ring and now a Guinness World Record? Final spurt – only five days left until the runners hit the race track. The Guinness World Records applicants are completing their last trainings and fix last things of their fancy dresses. Just about time to introduce our last record applicant: Richard from Lübeck will run the marathon dressed as the Holsten Gate, the famous landmark of his favorite city. If you take a close look can even see the logo of the city´s 875th anniversary on his costume. After the first kiss and a successful proposal to his wife at the Berlin Marathon he’s looking forward to make his next big memory: a Guinness World Records attempt.